With the great pumpkin project completed -- and the garden put to bed for the winter -- I need something comforting and confounding to keep me occupied during these next dark months. I am a decent cook, but the art of baking, in general, has eluded me over the years. Ultimately, I think it's the precision of ingredients and choreography of blending and cooking that frustrate me. I like to improvise and there's not much room for improvisation in baking. But this winter, I will rein in my culinary "wild child" and I will bake. Beginning with bread. I don't have an uber mixer or oven -- just me, a nice selection of wooden spoons and a white Frigidaire self-cleaning wall oven circa 1992. I should also mention I have lived in old, drafty houses -- 80 and 68 years respectively -- since we moved to Bermtopia. It's hard to execute the instruction, "raise bread in a warm area free of drafts," when you don't have warm areas free of drafts. And finally, the chemical conundrums of yeast completely mystifiy me. Nevertheless, off we go. I can do this. 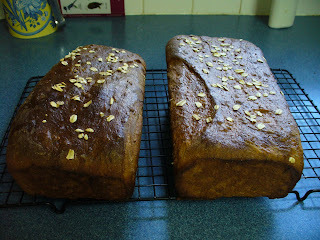 Bread #1 -- oatmeal wheat bread. 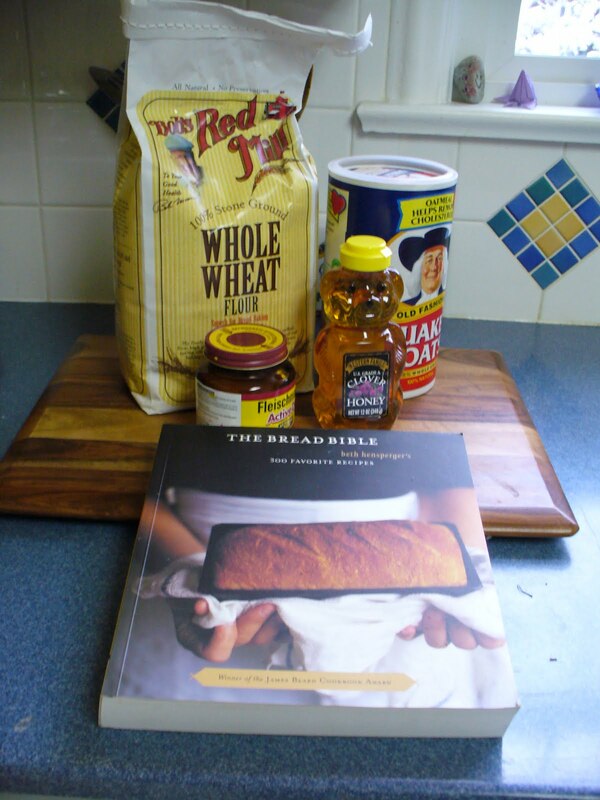 I start off with a little pep talk from Beth Hensperger, author of "The Bread Bible," laying out the basic theory behind bread baking. Then it's time to take plunge into that mine field known as making homemade bread. The first land mine -- proofing yeast. I'm using the "direct method" -- throwing together a little yeast, some type of sugar and warm water. I'm supposed to end of up with a bowl full of foamy, fragrant yeast love. In the past, my attempts in this department have been less than inspiring, resulting in a product far different than foamy, fragrant yeast love. Instead, think cold water with despondent yeast pellets floating aimlessly around in a bowl. This time, I measure the yeast and honey with the painstaking precision of a mad scientist. I pull out my trusty deep fry/candy thermometer and make sure the water temperature is between 105 to 115 degrees. Check. Five minutes later -- WTF! It bubbles, foams and expands. I have foamy, fragrant yeast love. Now on to land mine #2: Kneading. Hensperger says kneading "transforms dough from a rough, shaggy mass to a soft and pliable ball." Gluten is formed, which is"strong enough to contain the expanding carbon dioxide gases that are a by-product of of the yeast's reproduction." There's carbon dioxide in bread? Who knew? and duly noted. Bread and global warming -- is there a connection? I knead for 10 minutes and voila! I have a "soft and pliable ball." But now -- where in a 68-year-old house that, even with new energy-efficient windows, still feels chilly do I find someplace that is draft free and 75 degrees? The stars, serendipity and Saturday laundry align: My laundry room, adjacent to the furnace and with washer and dryer chugging away, is the perfect room for raising dough. Works like a charm. Plus I get all the laundry done. Brilliant. Two risings later, it's all over but the shouting . 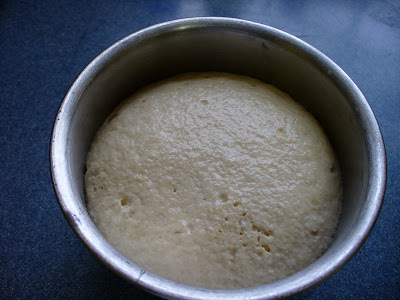 Well, until I partially deflate my perfectly domed loaves while brushing on the egg wash -- the last step before baking. A minor setback. I'll do better the next time. Thirty-five minutes later, I open the oven door oh-so-tentatively -- there, in their mahogany-brown glory, are two loaves of bread. A little more rectangular than your traditional loaf of bread, grant you, but lovely to my eyes and -- as we discover once cooled -- actually edible. Next week: White mountain bread. Bring. It. On.